September is Hunger Action Month: Who’s Helping the Hungry? Yes, this is a month to take action to stop hunger. Actually, we should remember this every single month because there are a lot of people who go hungry in our communities. It goes well beyond a single month and must be something we continue all year round. I try to do this every month myself since I have a co-worker who is a regular volunteer at the Hawaii Food Bank. Whenever there’s a good sale on some canned or dried goods, I buy a bunch at Costco or Longs and share the extra stuff with whom ever may need it. If I just hang on to it, it will likely go bad so sharing it with others is a worth cause to me. It’s something small that I can do hopefully to help others. I also want to be that example to my children to look beyond their own noses and help others if they can. I remind them how lucky they are to have food every single night and never have to go hungry. A good sense of appreciation needs to be instilled in kids nowadays who have everything but still complain of not having what they want. We forget that once our needs are met, it’s easy to overlook it and take it for granted. I have to say that I was really disappointed a few weeks ago when I read that a well-know chef, Ed Kenney, has decided to align with the Hawaii Center for Food Safety and help them fundraise for their Chef Action Network. I think it’s great that he supports local and sustainable food and don’t we all support that?! However, the Center for Food Safety is not about making food affordable but rather making people fearful of food and looking at ways of actually making it more expensive. You’d think that with a name like that, they are about making food safe but really, they are about pushing organic food and labeling under the assumption that biotech foods is not safe. It’s elitist kind of thinking that is being pushed here once again. One thing interesting to note is that speaking of food safety, it is a law that any food handling must be done with gloves to prevent the spread of potential contamination. If the Center for Food Safety were truly about safe practices, they would have told Chef Kenney about this potential violation of his handling of food. If the Center for Food Safety were successful, they would have gotten GM foods labeled. That GMO label will not only increase prices on food but also require a complete overhaul of our food processing all together that will definitely cause increased costs across the board. Not only will the consumer have to pay more for food but so will the chefs who own businesses in our communities. Will these small business owners be able to handle such extra costs? I highly doubt it. It is no wonder why restaurants are some of the most difficult businesses to run with the costs of supplies and labor constantly going up. When a business closes shop, it means less employment opportunities also. These activists group aren’t about helping Hawaii folks as they claim either. They succeeded in getting the flawed Bill 2491 passed only to have it overturned in court as expected. This in turn has taken some $210K to defend the bad law which doesn’t include any of the other costs of other staff and resources used in all of the proceedings. No sooner than it was deemed invalid, did they immediately start to look for cash for more flawed bills. Couldn’t all that money have been used to helped the needy in the community instead on bad advice of activists? Why are they fundraising for themselves and not others who could really use some help right now? You will never see a Center for Food Safety feed the hungry food drive or affordable food coalition from these people because that is not what they are about. I can’t help but be very disappointed that well known chefs like Kenney have not looked into this group further before deciding to support them. When local people are depending more and more upon food banks and food supplement programs and a greater percentage is living in poverty, he wants to support a mainland based group who’s main goal is increasing food costs using fear and misinformation. This group is also about demonizing our local papaya growers who have survived the papaya ring spot disease and are still farming as a result. 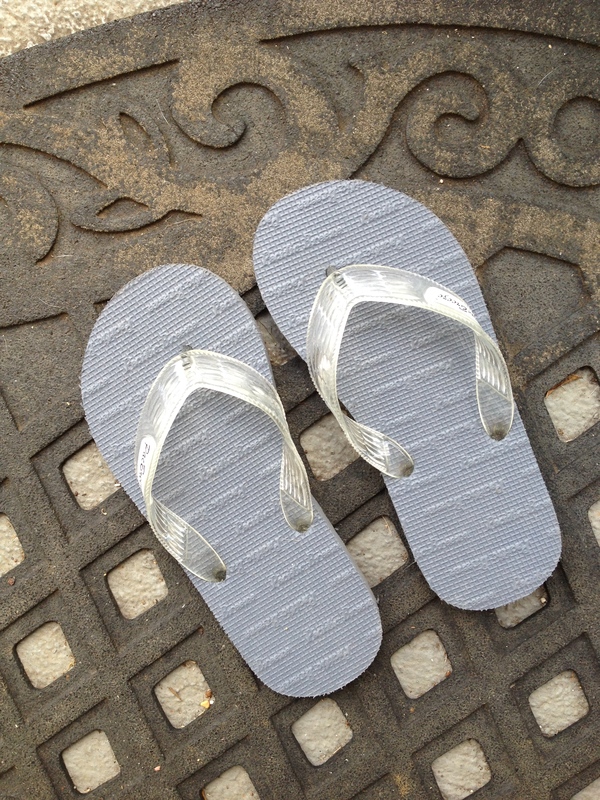 How does supporting the Center for Food Safety help our rubbah slippah folks? Basically, it’s not about the locals but about a new bunch of mainland folks telling locals how to farm and what’s good for them. You can bet they don’t have a pair of these at their door steps! **Update! In today’s Star Advertiser, Kenney is featured there again and he’s wearing gloves while preparing food. Good. 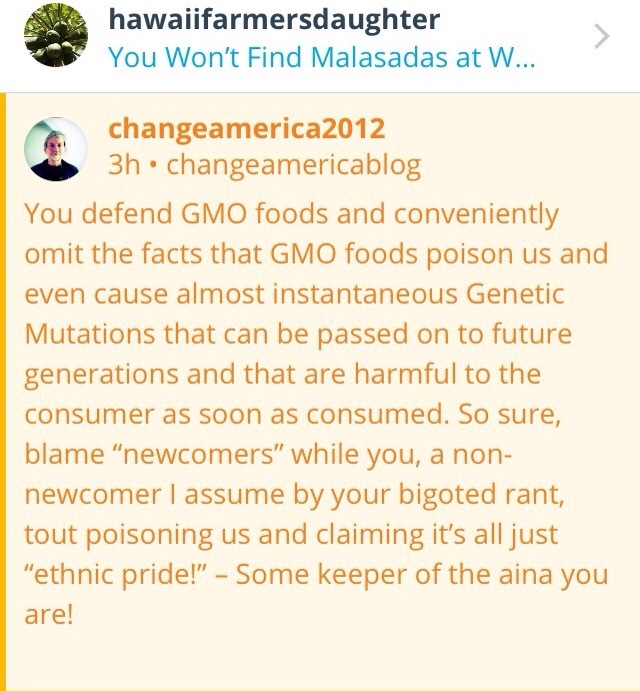 And once again, Ashley Lukens of the Center for Food Safety is touting their disingenuous message again to the public. No surprise! Note that they aren’t about helping the hungry! 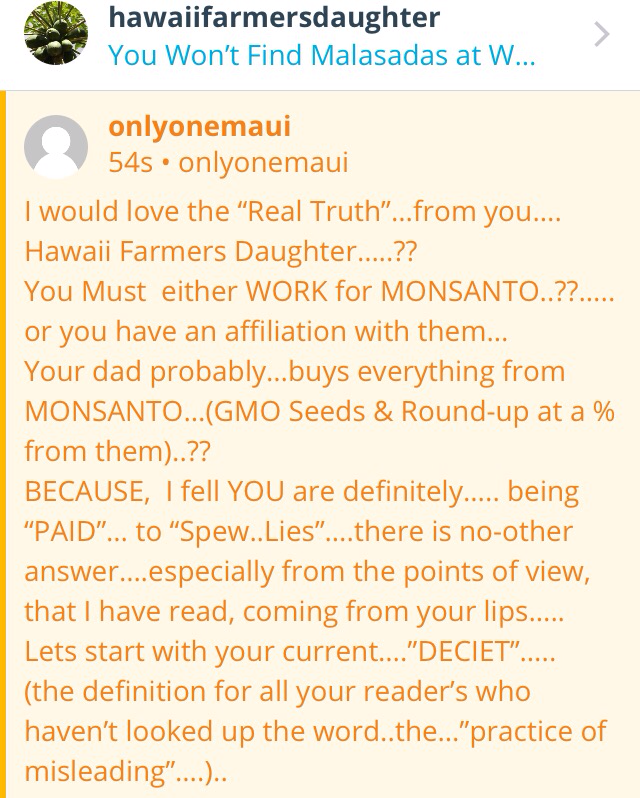 Just the other day, Civil Beat’s reporter, Anita Hofschneider, did what I call a “fuel the fire” article about campaign spending on the GMO issue here in Hawaii. 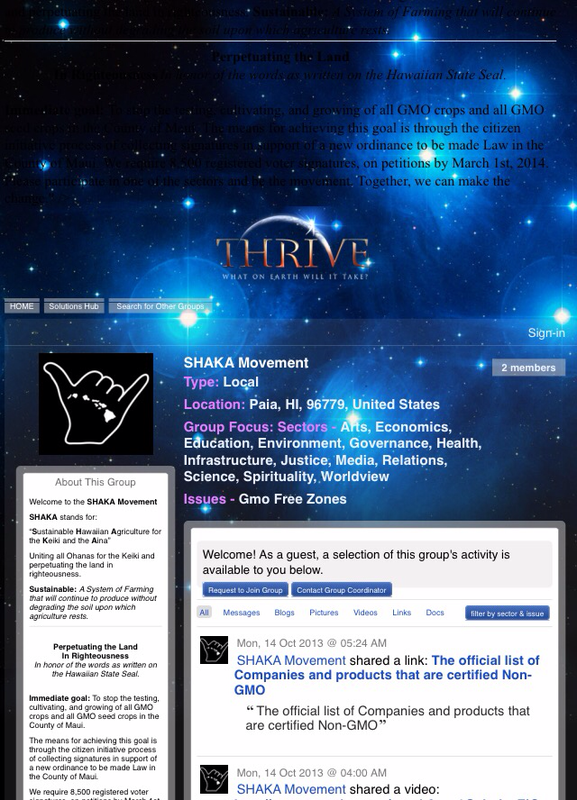 The title was, “Donations Pour in to the GMO Debate, But Are they Being Disclosed?” It goes on to talk about how the SHAKA Movement is fundraising and trying to influence the supposed moratorium vote and have not reported their funding properly. It’s interesting because as you read further, then it starts to once again show how the biotech companies, who properly reported their contributions to candidates. They, of course submitted the proper contributions according to law, and are somehow trying to be skewed in this article and tries to skewer the candidates who received money from them further fueling corporate hate. Let’s talk totals here and simple math. The article states that the biotech companies have spent a total of $58,000 this election cycle. It also stated that the Center for Food Safety PAC raised some $39,000 with some 90% coming from OUTSIDE funding! 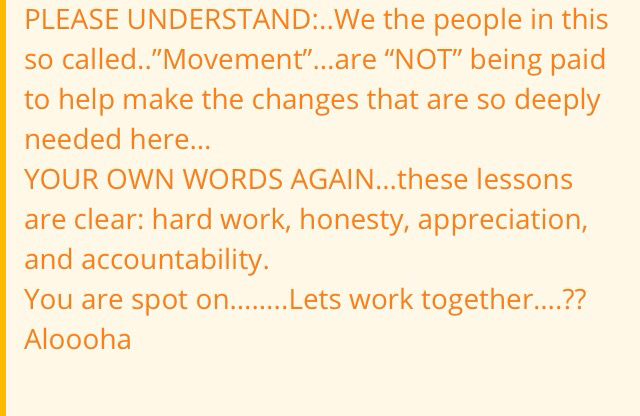 It’s not a “local” grassroots movement at all! Monsanto and many of the other biotech companies provides thousands of jobs across our state, many of which are in the high tech sector and help to maintain the former sugar cane and pineapple plantation lands as ag land. What has the Center for Food Safety done for the rubbah slippah folks in terms of contributing to our economy? What have they done for our farmers across our state? I haven’t a clue because they haven’t done a thing other than bring more outside mainland money to dictate policy here. Where’s the organic feed the hungry food drive? 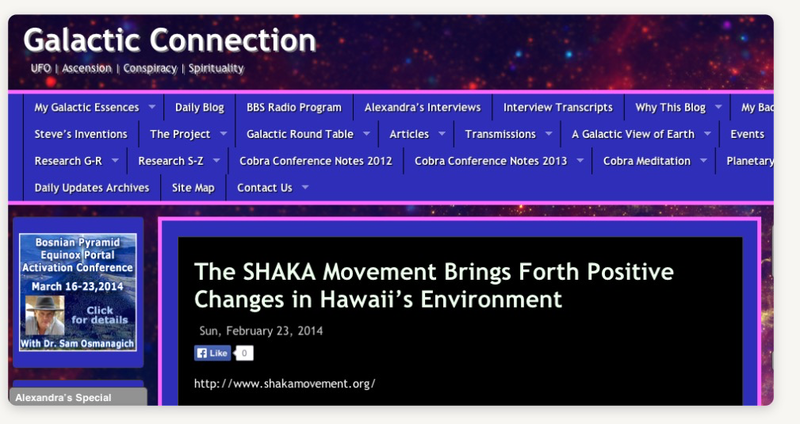 Where’s Vandana Shiva donating her $40K talking fees to the Hawaii Food Bank? According to the food bank, $10 can provide 25 meals! She’s come here at least twice and $80K would have provided some 200,000 meals! The $20K infusion to sign the SHAKA Movement petition would have provided some 50,000 meals for the people who are needy in Maui. The $5K that the part time resident from California who gave to the Babes Against Biotech would have provided some 25,000 meals! The Babes Against Biotech received a total of $12,600 to fund them would have fed some 31,500 meals! 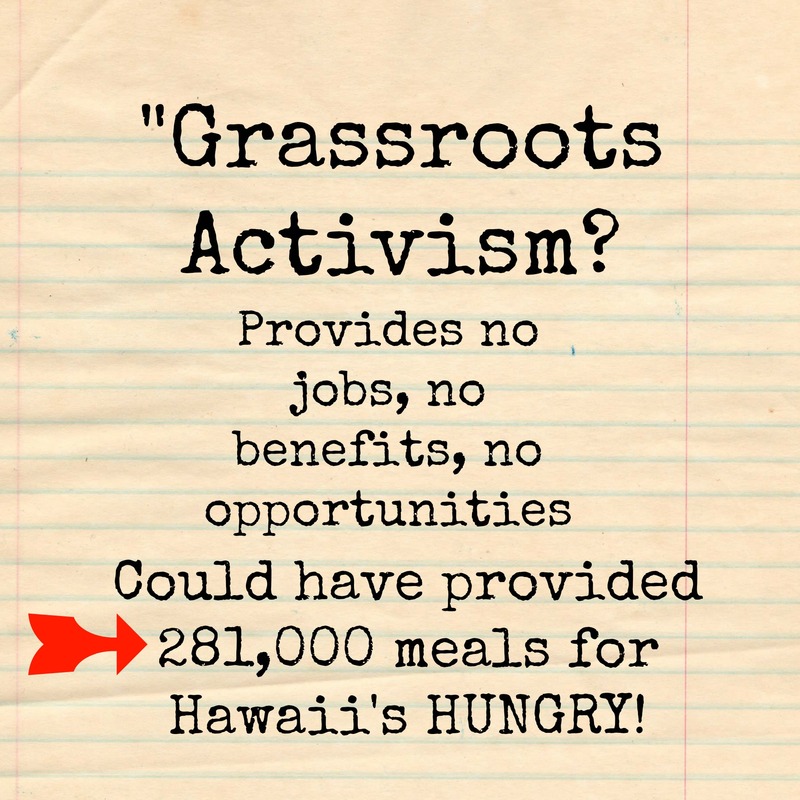 In total, if all the money being brought into to Hawaii for activism purposes are added together, 281,000 meals could have been provided to the needy! What’s worse is that many of these donations to these activists groups are through non-profits so they are scott free of paying taxes that could have been used for social service programs like these! One can criticize the biotech companies for “buying” politicians and so on but the fact is, these companies provide jobs, donate time, money, and man hours to many community events that is never featured in the news or media. They do a lot more that will never be seen or recognized by activists but it’s being done and many lives are being impacted by their contributions. We can demonize the corporations, but ask yourself, who really is contributing to our people and our communities? Who provides training, employment, and benefits to many of our local folks? The companies do. I can tell you that it isn’t the activists or their candidates! Why aren’t our political leaders worried about feeding these people or giving them better education and employment opportunities so that they can afford to feed themselves? 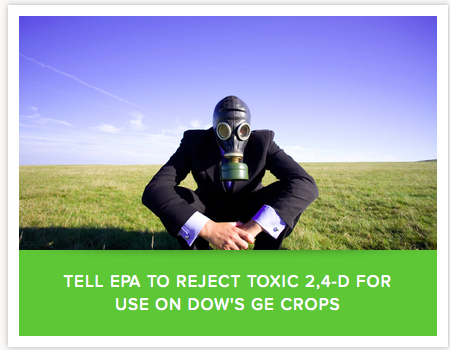 The labeling issue and pesticide issue are at the forefront however, is that really a priority at hand? We can argue back and forth about what science to believe and where the important issue lies, but if we forget the basic needs of people, that is a major problem with politics today. When one runs for office, is your platform one that will really help your local people or are you self serving to that attractive mainland money and elitism of going organic, or will you help those that can only afford Times, KTA, and Foodland? Several months ago, I became aware of the Washington, D.C. based Center for Food Safety arriving in town. 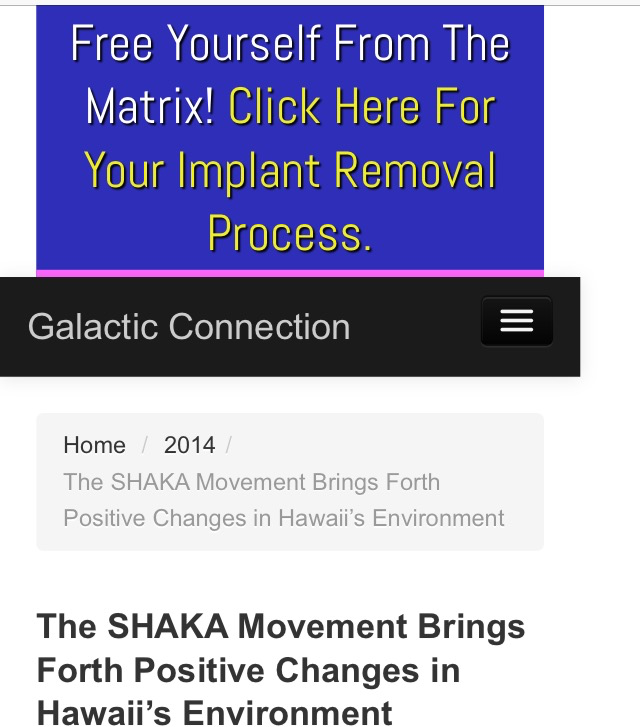 I wrote a post about this activist group when I saw it posted on the Kanu Hawaii site. They are now here in our islands to try and bring their mainland influences to our smaller communities and it’s clear what their true agenda really is again. Here’s a flier that was sent out in to people in the Kaneohe/Kahaluu area by the Center for Food Safety just a few days ago. My entire family members are long time residents there for over 60 years now and seeing this arrive in our mailboxes did not please us at all. It’s not surprising at all that HCFS is supporting Harris, who is the executive director of the very anti-biotech group, the Sierra Club. He was also a proponent of supporting Jessica Wooley in getting her the House of Representatives seat several years ago. Now he is seeking to fill that seat with his mainland style activists’ values with a mailer from the HCFS. He also sent me a message about a month ago regarding his candidacy. I’m guessing he has read my criticisms of where he stands as a political leader in all of this. It’s great that he wants to talk about growing more food and working together for better policies. So my response to him was this. Well, I was so hoping for a response to my question but never got it. 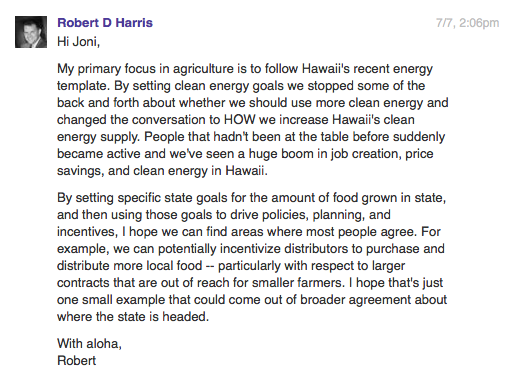 I’m starting think that these politicians are really not about working together when they openly support groups like the Center for Food Safety and Earthjustice, who have a single agenda for Hawaii, which is to use scare tactics to take away agricultural tools from farmers and ranchers. 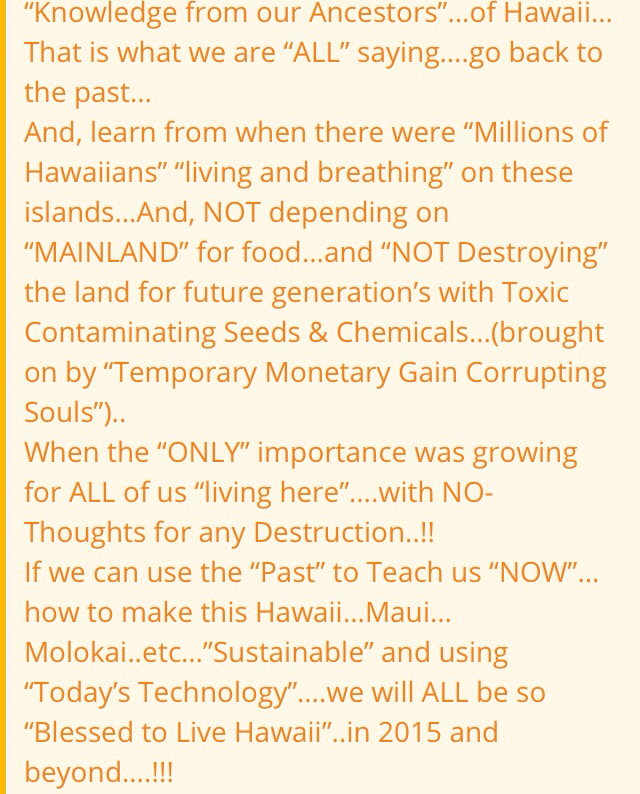 They are lawyers and environmentalists, not farmers or business owners and they don’t know our history in Hawaii, yet they are willing to come and take over the conversations. I find the flyer quite amazingly misleading which is of no surprise when it comes from activist groups who are always misinforming the public. Here’s the blunders I found on those mailers. The Sierra Club that Harris supports is against biotechnology so knowing that connection, he’s definitely against the papaya farmers and ranchers in our islands who have used this technology for 20 years. How can you say you’re a champion of the local farmers when you work for a group that opposes their practices? There’s several farmers in his district that he apparently are not aware of that he forgot to talk to. The Sierra Club has a legal arm known as Earthjustice that they use to enact lawsuits in the name of environmentalism and later use it to funnel cash into their coffers. It’s basically a money making operation of the Sierra Club. If they are willing to protect agricultural lands, why has Earthjustice and the Center for Food Safety trying to join the lawsuit against Big Island farmers? Not only is Earthjustice suing on the Big Island, but they have also joined the lawsuit in Kauai against the seed companies. If they are about protecting agricultural lands, why are they fighting the people who are using it to farm? If they about helping Hawaii, why are they suing the smallest farmers anyways? Once again, the disingenuous “right to know” argument enters the picture. That’s the fighting cry of the activists like Naomi Carmona and her Babes Against Biotech crew. She and other activists don’t care about the “right to know,” for if they did, they wouldn’t join groups that are GMO free. Well, we all know the truth about these claims for the activists clearly put it out there for all to see. They also want the 1.3 million Hawaii folks to endure increased costs associated with labeling which will really help all local people make a living here. 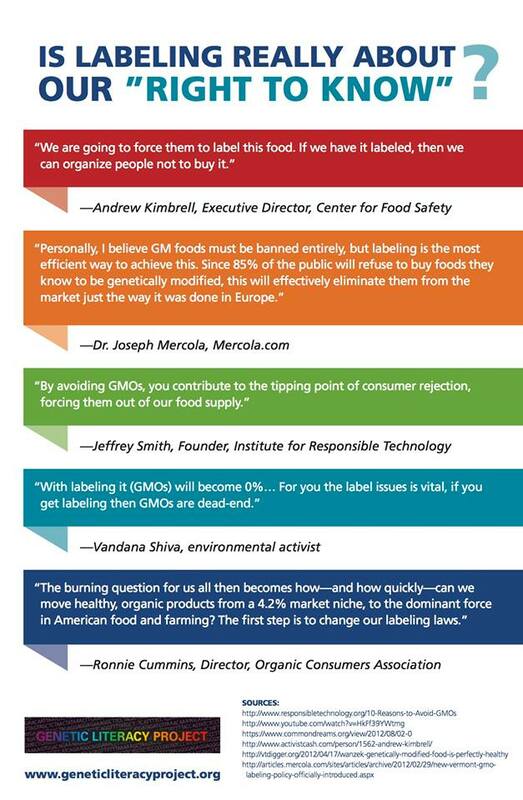 These activists don’t seem to realize that they have a label called organic and GMO free but are willing to burden everyone for their disingenuous claims. 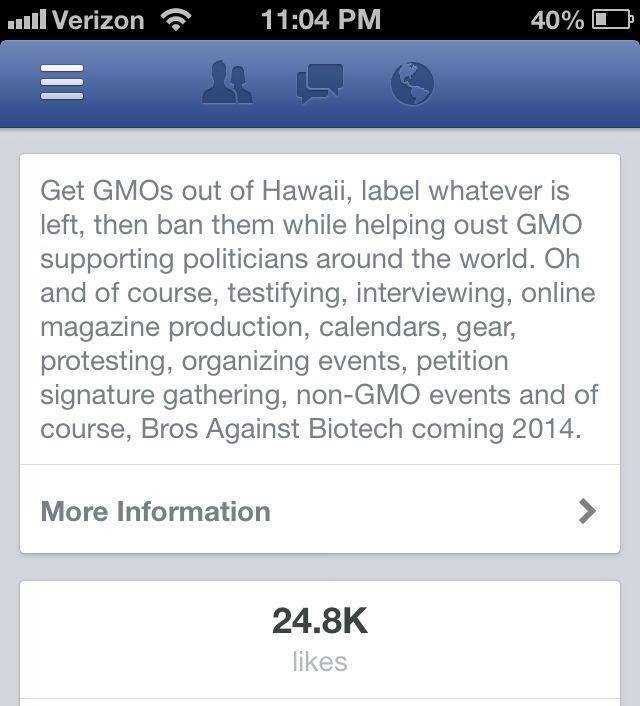 First of all, Kaneohe has very few farms, let alone GMO farms to begin with. 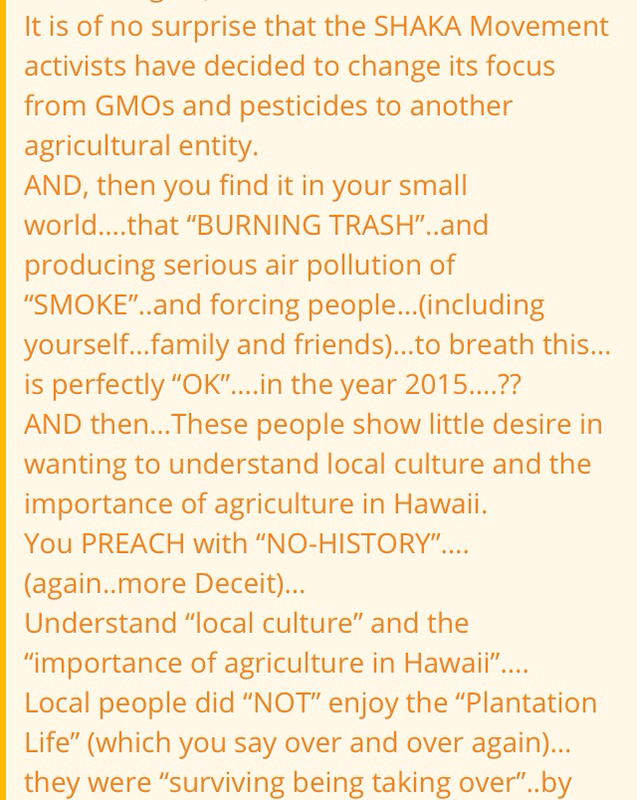 Ashley Lukens, a political science doctorate, seems made a erroneous statement on a CB article stating that, “The issue of genetic engineering in Hawaii is an issue of pesticides.” (It’s always the non-farmers who are quick to spread their pseudo-expertise about how and what farmers should farm.) The farms are out in the more rural areas and homes are far apart there and the farmers themselves live on the same property and are small. Many have been there for decades with no report of illness at all. None of these farmers waste anything for that matter and only use what is needed and to assume that they all use dangerous pesticides is so wrong at every level. Ms. Lukens doesn’t realize that Hawaii people live in a tropical environment that bugs and pests thrive. Shall we forgo the termite treatments, fly traps, ant sprays, roach treatments, rat bait traps and allow pests to invade our homes, schools, and hospitals. What even more interesting is that the district that Robert Harris is seeking to represent doesn’t even have a hospital in it! Kaneohe is a completely different town and they obviously haven’t figured it out. 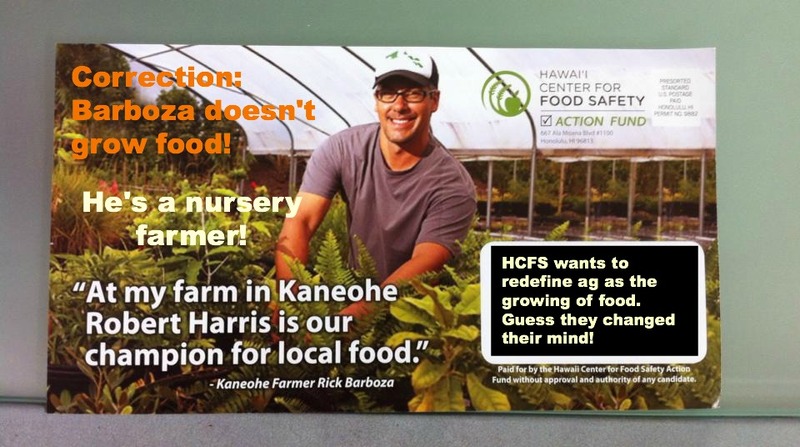 This statement on this flyer clearly shows the Hawaii Center for Food Safety’s fear mongering messages. They don’t live here in our community and it shows. Many of my friends and family who received this card look at the farmer in the photo and said, “Who’s that?” No one seems to know who this farmer really was. 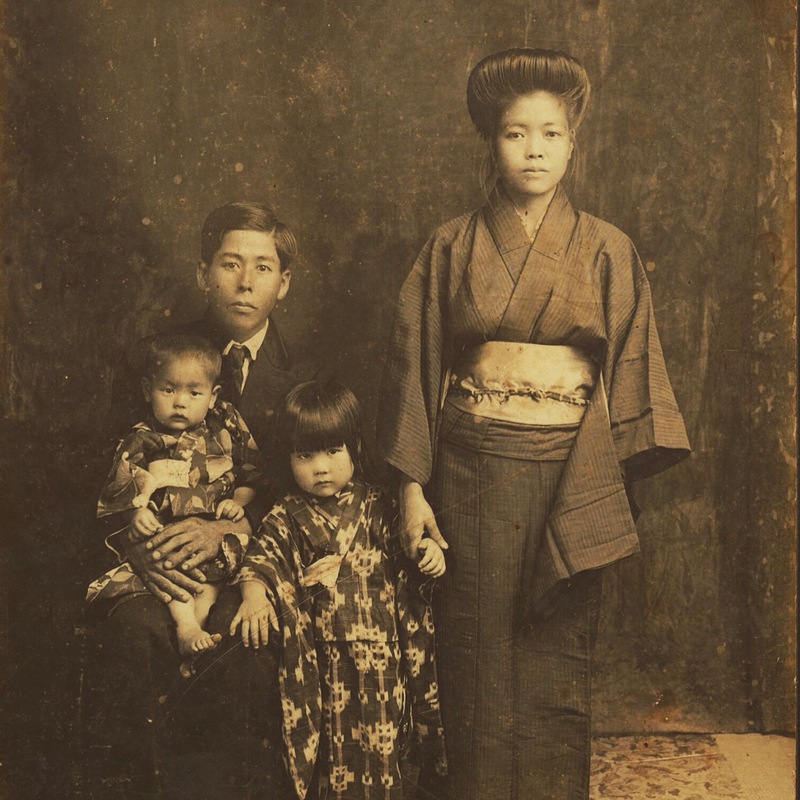 Turns out Rick Barboza isn’t a food grower but a Hawaiian native plant grower in Kaneohe. 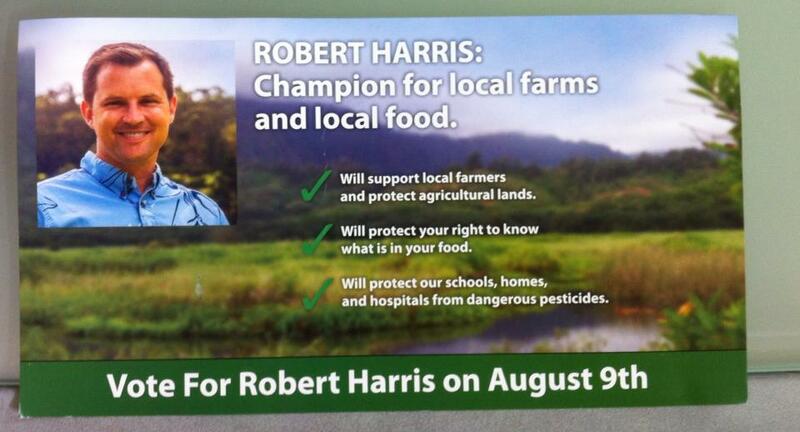 Apparently, the Center for Food Safety and Robert Harris himself didn’t bother to talk to the long time food growers in his district. 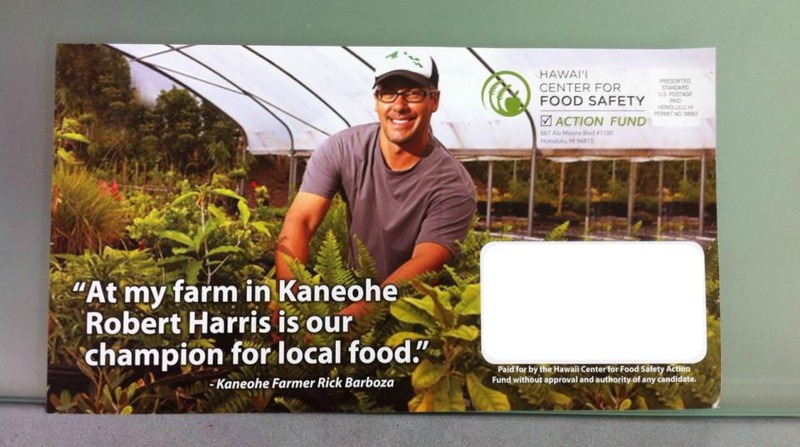 If Harris is going to support local food being grown, how come he didn’t come talk to some of the long time growers in the area? Shouldn’t he have a photo of a farmer of that person who is actually doing the work to grow food? I would think so but the message is clear, they are not about including these others in the conversations apparently. They have their own mainland agenda and aren’t going to include the local people. It’s interesting that the Center for Food Safety did not put a non-food producing farmer on their mailer. 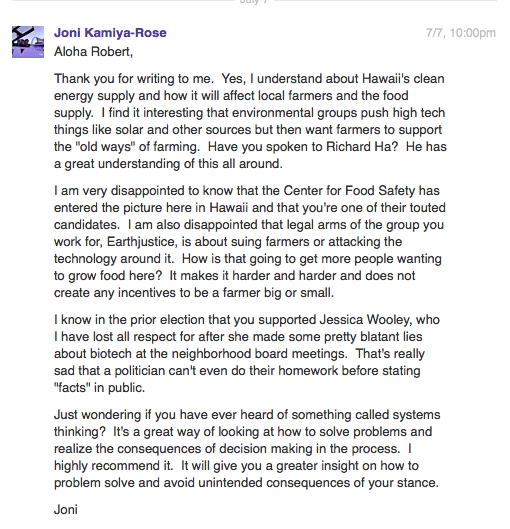 Last year, then Representative Wooley made a presentation to the Kaneohe Neighborhood Board that she was planning on redefining agriculture as the growing of food. They must have changed their tune to the politicians as they are putting a non-food growing farmer on there. 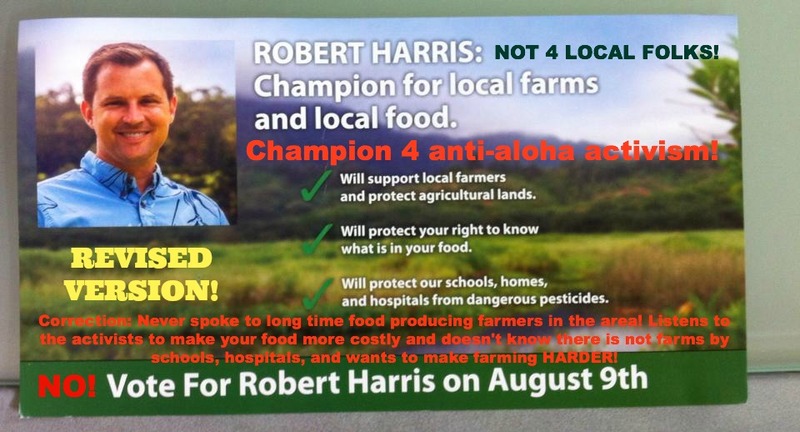 What’s also telling about Harris’ agenda is that we can’t forget about the Sierra Club’s smear campaign against Pono Chong back in 2012 where they set up a site called NotPono.com and sent out fliers that led to his defeat. Local boy Pono Chong was ousted for supporting the developers and construction jobs that so many of our family members and friends hold in our communities. Who’s gonna provide and build affordable housing and jobs for these folks? The Sierra Club?! As we can see now, they are about taking things aways. I decided to take the liberty of correcting these fliers and hope that people realize what the message should really be. If we want honesty in our leaders, we better research who they really are and who’s backing them up. Let’s hold our politicians to a higher standard and seek for honest information on who they really are and what they support. It’s clear that mainland money is talking here by all the misinformation posted on those fliers. If we want a better Hawaii for the local folks, do you homework on your candidates and vote smart. Who is looking out for the rubbah slippah folks?